Do you want to hear my favorite fish joke? I heard it on Jay Leno years ago, and haven’t stopped telling it since. Ok, here we go – “What’s a fish without an i/eye?” It is …..fsssshhhhhh 🙂 Ok, you had to be there. Whether you love fish or a bit skittish about eating it, this is a lovely recipe for you to try. The fish lover in you will appreciate the simple, unobstructed flavor of salmon that is gently enhanced with the acidity of lemon and white wine (the acid works quite well against the natural oily flavor of salmon). Dill is the traditional accompaniment for salmon, and honestly, it looks quite pretty against the fish’ pink flesh. 2. Line a baking sheet with foil and lightly coat with olive oil. Place the salmon, skin side down, on top of the foil. 3. Season the salmon with salt and pepper. Lay dill sprigs on top of salmon and cover with lemon slices. Lightly drizzle with olive oil. 4. Pour wine around the salmon. Fold the foil around the salmon, forming an envelope. 5. Roast salmon until desired doneness (about 20 minutes for medium). 6. When serving, use a spatula to separate salmon from its skin and serve with wedges of lemon. Garnish with fresh chopped dill. 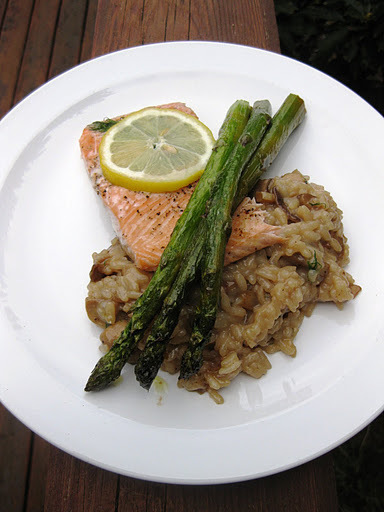 I served the salmon for Mother’s Day with Mushroom & Dill Risotto and a side of Roasted Asparagus. That looks absolutely fantastic! Love everything on the plate. Thanks! Luckily everything on the plate is relatively easy to make and good for you! I've made my salmon this way for years and it's always delicious. 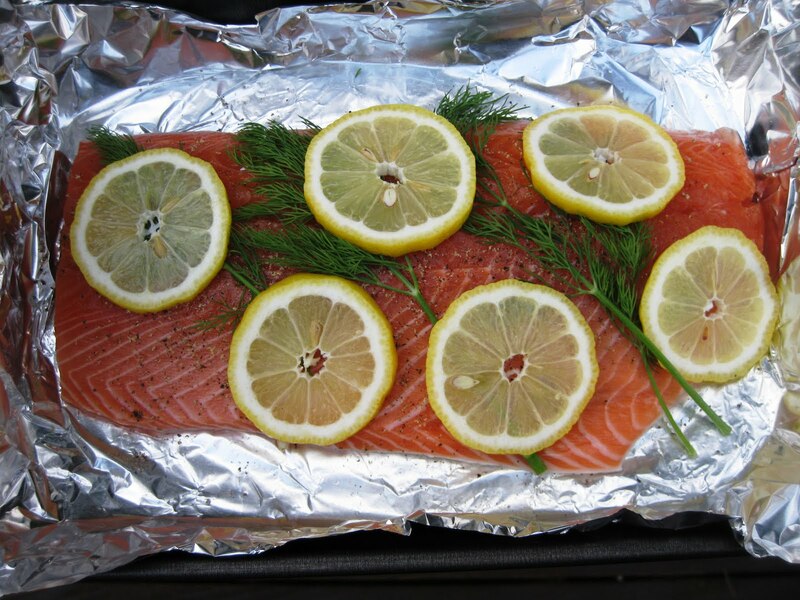 I have a suggestion though, it makes it much easier to eat without getting bits of dill in your teeth if you place the lemon slices in the bottom, layer the dill over, then put the salmon, skin side down, on top of the dill before sealing the foil & cooking it. When it's done cooking you peel the skin away and the dill comes away with it, but the flavor is still very much present and delicious.